G2 ANALYTICS DELIVERS FAST AND EFFECTIVE DATA COLLATION. Big data and predictive analysis are growing in importance in the healthcare industry. Healthcare organisations are able to make informed decisions based on significant datasets. Clinicians also need to gather clinical data in order to provide the best personalised care to their patients. Our solution, G2 Analytics, allows customers to collect, analyse and report on operational as well as clinical data. These newly-acquired insights provide the information that is needed to make the most effective decisions that are in the best interests of the Trust and healthcare professionals, but most importantly their patients.  Ability to act on relevant data to make accurate decisions. Organisations can get to the heart of their data and optimise their processes. Insights in these statistics enable them to make significant improvements and well-informed decisions. The system’s modern dashboard shows real-time key statistics on the reporting process such as backlogs, turnaround times and employee performance. The interactive dashboard is intuitive and easy to navigate. Staff performance and output can be monitored and costs more easily managed. The graphical interface identifies bottlenecks to act upon. Efficiency can be increased. Customised reporting allows an organisation to look into data in specific details. Our solution allows the creation of customised overviews of document flows based on relevant variables. Key performance indicators can be easily tracked. Information is updated automatically and reports can be managed at departmental level without the need for IT support. The amount of clinical patient information available in reports can make it difficult to easily obtain the relevant data. Yet the right patient data is of great value to detect new patterns in different pathologies and decide on specific therapy and medicines. It is therefore of vital importance that these large sets of data are made available. These valuable clinical insights also enable healthcare professionals to contribute to research and to optimise and personalise quality of care. into bespoke reports. Either way, all the clinical information needed is available in one click. The data can be exported to an organisation’s own visualisation tools or statistical software. The reports are always anonymised to protect patient’s identity. 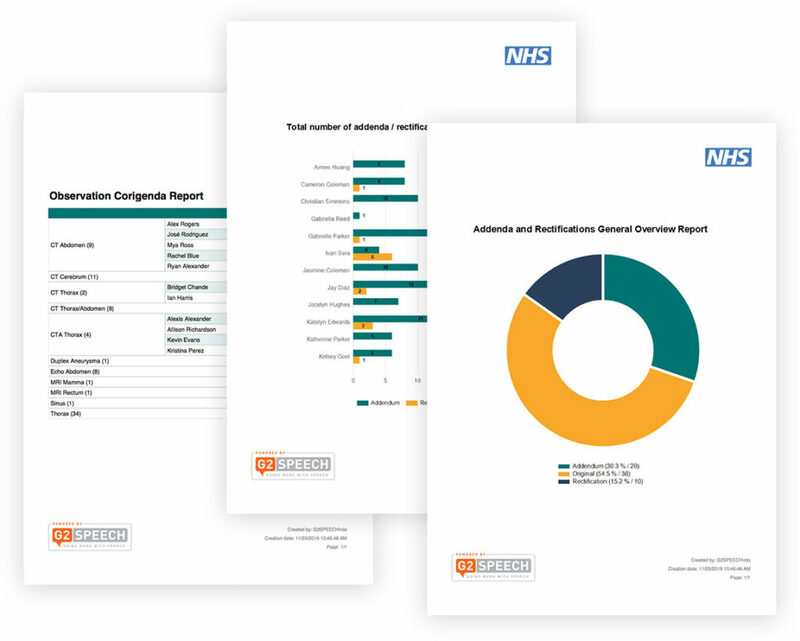 Structured Reporting enables an organisation to gather clinical data with G2 Analytics. This innovative solution allows clinicians to simply and quickly create reports, within templates, using speech recognition. Templates are intelligent and adapt to the information that is filled out by the clinicians. They guide clinicians through their reports. As these reports are very complete, the communication with other care providers improves significantly. Furthermore, the module provides an easy way of adhering to national guidelines and department protocols. The SpeechReport platform provides a fully automated workflow with integrated advanced speech recognition based on Microsoft technology. The solution allows organisations to create, correct and manage all of their documentation in one central location and helps to streamline correspondence processes. G2 Analytics works seamlessly together with SpeechReport and its additional functionalities such as Structured Reporting, G2 Mobile, G2 Cloud and Outsourced Transcription. G2 Analytics keeps track of the results achieved. Information on turnaround times, combined with digital dictation or speech recognition rates, will be available at a glance on the dashboard. G2 Analytics displays the number of documents created while using our apps. Turnaround times will decrease even further, compared to the number of documents created on local computers. We offer the option to host our solutions in the cloud. Deploying G2 Analytics in our G2 Cloud will give users flexibility – they can access our solution from any location and at any time.